« Cameras ready… and ROLL! It started as a throw-away comment. I was complaining to my husband that our 1-year-old son will chew on anything except, of course, food. The remote control, his wooden cot, and his books all now bear teeth marks. Yet hand Mr Squish a piece of nutritious food and he shows the disdain of a king being served 2-minute noodles. “You know,” I said to my husband. 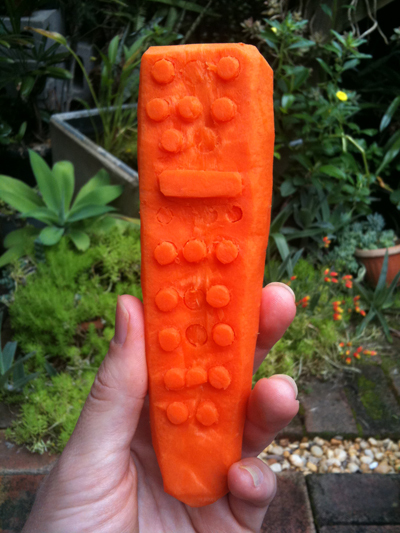 “I should whittle a carrot into the shape of a TV remote control. Then he’d bloody eat it”. And that, ladies and gentlemen, is where most sensible people would have left it. But not me. No siree! So today I sat in my backyard, whittling away at a carrot with my old kitchen knife. Disappointingly, we don’t own a rocking chair or a banjo – and I’m not married to my brother – or else the scene would have been perfect. After a few minutes of whittling, I came inside for a glass of water and to give the neighbours a break from my swearing. “How’s it going?” asked my husband, somewhat redundantly. “It’s a disaster,” I replied. “The buttons keep falling off!”. Anyway, against all odds and the giggling of my husband, I persisted. 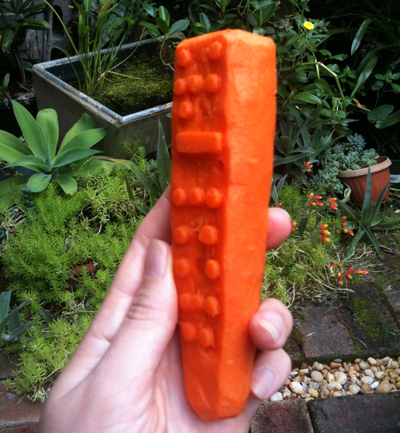 And now I am proud to present perhaps the world’s first TV remote made from a carrot. BEHOLD! Check out the 3D effect on the buttons (the ones that still exist, anyway). When I showed my husband he said, “It’s better than I thought it would be”. Which obviously just means his expectations were extremely low. Isn’t that lovely. You’re welcome, son. I’ll remember that. In a few years, when he brings his first painting home from school, I shall both ignore it and cry about it simultaneously. Two can play at this game. Anyway, after my disappointing reaction from my son, I searched on Google to see if anyone else had whittled carrots into household devices, but found nothing. (What on earth are people doing with their days? Working? Contributing to society in a meaningful way? I mean, sheesh!) So I suppose that makes me the world’s leading authority on the subject! To that end, I would like to announce that I’m available for public speaking gigs and instructional workshops. Just pay for my flights and accommodation and I will supply my own carrots. I am generous like that. Postscript: We ate the carrot for dinner. My claims of it being a masterpiece clearly fell on deaf ears. Yes, let’s pretend that THAT is why he dissed it. He was too impressed. I like it! Thank you! As the world’s second-most authoritative commenter on remote controls that have been whittled from carrots (I read your entire post, that makes me almost as qualified as you, right?) I think I may be able to offer some constructive insight as to why Mr Squish refused to chow down on what is undeniably the world’s greatest technological device, carved from a vegetable. My insight can be summed up in four words: Not enough choking hazards. Perhaps next time you might like to serve it up with a plastic bag and small lego pieces. It’ll be like giving candy to a baby. Excuse me, but purely reading about my whittling glory does not a world-class whittler make. You must FEEL the carrot, get inspiration from it, then eat it for dinner. Only then shall you know greatness. And next time I might try whittling candy. Oh no, you so should have pretended to use it, then told him he couldnt have it! NOW you tell me! I will totally try that with my next carrot because I’ve stupidly already eaten this one. It’s like my mum always said to me, “Don’t eat your remote control-shaped carrot before visitors to your blog have best instructed you on how to get your son to eat it”. Why are you all pretending, people? I”LL say it. Ms FOAS has clearly lost the plot and needs to spend time at a rest clinic, far far away from any and all knives and other sharp instruments. This reminds me of Close Encounters of the Third Kind when the main character, responding to alien mental forces, starts moulding the UFO’s intended landing site with mashed potato in front of his increasingly alarmed family. I rest my case. I don’t know if I like this attack on my good name. Anyway, it’s not alien forces guiding me. That’s crazy. It’s zombies. BIG DIFFERENCE! Please get your facts straight in future. Or is that “whittles” herself in … ??? Having no children of my own, let me just tell you how it is done with . Children do not eat vegetables. They will not put them in their mouth, remote control shape or al-la-naturale. Only when a vegetable is pulped into the worlds best mash potato will they let it pass their lips. You may also find whittling the potatoes into a french fry shape works wonders. You make a good suggestion with the potato. Why should I stop at carrots? Mr Squish tries to chew on my sandals so maybe I could whittle a pair out of sweet potato! Stay tuned. What are the chances that if you carved a chocolate bar into a remote control shape that he would eat it? Incredibly high. Damn, I should have dipped the carrot in chocolate. You live and learn. Fab post! I love your carrot carving. You do realise that your son will soon start to demand that all his vegetables are cut into different shapes before he’ll eat them, don’t you?! On another point, why don’t toy manufacturers make realistic mobile phone and remote control teethers? We all know that todays sophisticated babies prefer these to the garish red, blue and green toys that they currently make!